WOOOOOT! 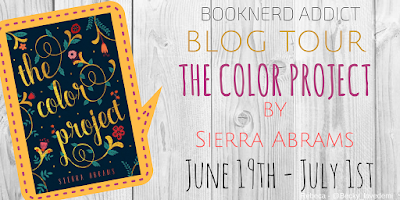 I can't believe it's already time for my stop on the The Color Project blog tour and also that there are MERE DAYS until one of my best bookish friend's DEBUT BOOK releases for the world to read. Sierra Abrams is one of the kindest humans I've had the pleasure of getting to know and I'm so so happy for the chance to have her on my blog. Thanks so much Helena and Becky from Book Nerd Addict for putting together this BRILLIANT TOUR! Blurb Description: Bernice Aurora Wescott has one thing she doesn't want anyone to know: her name. That is, until Bee meets Levi, the local golden boy who runs a charity organization called The Color Project. Levi is not at all shy about attempting to guess Bee’s real name; his persistence is one of the many reasons why Bee falls for him. But while Levi is everything she never knew she needed, giving up her name would feel like a stamp on forever. And that terrifies her. When unexpected news of an illness in the family drains Bee's summer of everything bright, she is pushed to the breaking point. Losing herself in The Color Project—a world of weddings, funerals, cancer patients, and hopeful families that the charity funds—is no longer enough. Bee must hold up the weight of her family, but to do that, she needs Levi. She’ll have to give up her name and let him in completely or lose thebest thing that’s ever happened to her. For fans of Stephanie Perkins and Morgan Matson, THE COLOR PROJECT is a story about the three great loves of life—family, friendship, and romance—and the bonds that withstand tragedy. 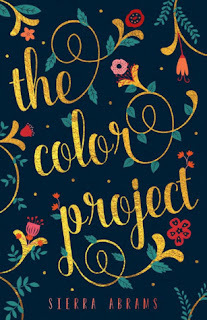 Aditi: The official The Color Project Playlist is AMAZING (And I can't wait to read the book and listen to the playlist while doing so) How does music shape your writing process? What are some of your favorite songs? Sierra: When I read the topic of this guest post, I almost screamed. If you follow me on any social media, you know I LOVE MUSIC. It means as much to me as reading and writing do. I grew up with my parents buying CDs all the time (they owned 500+ CDs, which was a lot before we had digital music) and listening to music everywhere: at work, in the car, at home. There was always something playing in the background. Naturally, this means music plays a HUGE role in my writing. Every day, a song—new or old—will inspire an idea, concept, sentence, or character. I’ve had entire story ideas sprout from single lines in songs I’ve heard hundreds of times. Sometimes, it just has to click at the right moment. I try to write with music in the background, and most of the time it works, but sometimes I do need silence. And weirdly enough, I often find myself changing my playlists around. I’ll be writing a contemporary romance and yet I’m most motivated or inspired to write by one of my fantasy playlists. Or I’ll be working on one of my magical realism concepts and suddenly the perfect mix is a heavy metal album from my childhood. Everything about this is weird, and I can’t explain it, but it’s true. I tried to list off some of my favorite groups/albums by genre, but that gave me too much freedom and there were WAY too many. So instead, I made a playlist of my favorite songs from my favorite groups from all the genres, and if you like one a lot and want more, find me on social media or let me know in the comments and I’ll give you more recommendations. It was extremely difficult to narrow that down. Oh my word. If you give any of these songs a listen, I’d love to hear what you think of them! If you’re a writer, did they gave you any character and writing feels/inspiration? What kind of music do you listen to when you write? Tell me all about it! And a big thank you to Aditi for having me on her amazing blog! You rock! And thank you to everyone who stopped by today…it means so much to me!